How could I have forgotten about this anime! I haven't watched this in years but I can't wait to sit through it again! The battles were great, the idea also quite unique and the character design was really pretty amazing. If you haven't taken the time to watch this, do it. It's only 6 episodes and well worth the time spent. A small stand-alone OVA, but an interesting look into slightly older fantasy shoujo. 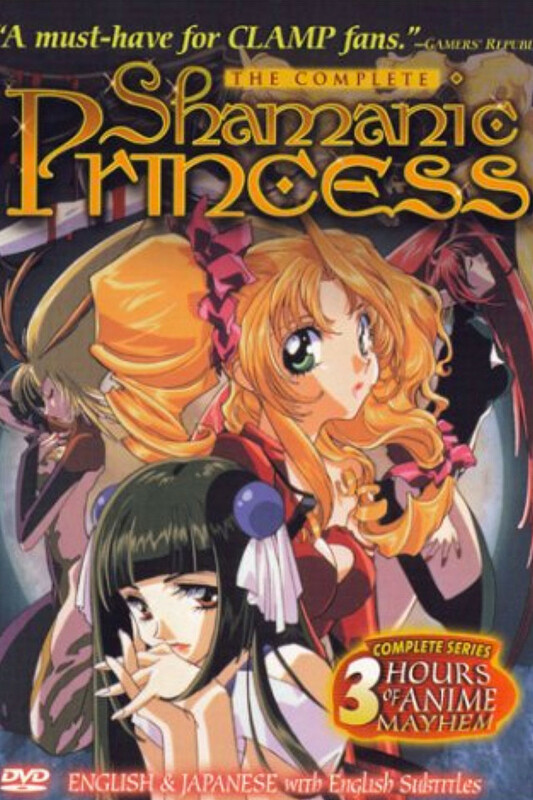 I'll get this out of the way first and foremost- there are hundreds of anime you should watch before Shamanic Princess, an obscure 6-episode fantasy series from over a decade ago, a series that few really remember and has had little impact on the medium. So why the 4 stars exactly? Mainly personal reasons. This was one of the first anime I had watched and it keeps a special place in my heart for that. Of the few things I can say objectively about this work is how the art style and character designs are unusual. Only Magic Knight Rayearth and maybe 3-4 other anime from the 90s shared this same character designer. The world is one that is both mystifying and beautiful, further accentuated by a soundtrack that I still listen to even today, and opening and ending themes that embody the charm of 90s fantasy anime that has since passed. This little series is like a relic of that time. The story is nearly incomprehensible thanks to the senseless decision of placing the episodes out of order. The characters have little time to develop but still manage to be at least artistically diverse and have interesting relationships with one another, reminiscent of the quirkier Clamp works. Overall I would recommend this if you are curious about some of the older hand-drawn fantasy anime. This was a favorite of mine growing up. The art was fantastic for it's age. The story is all over the place and leaves you with a sense of confusion as it takes more than one watch to catch everything in my opinion. Personally I think the fight scenes make this worth watching once all by itself. Try it, you might like it. Beautiful art style, good animation for the era, and a classic, original story. The two last, bonus episodes are not necessary, but are incredibly endearing. Kind of dark, with a psychological edge. Definitly in the vein of Darkside Blues and Utena, if believable. Amazing visuals. Definitely one of the best mahou shoujo titles out there. The show is good in concept of world, originality and design but i found some of the characters very one dimensional. Otherwise amazing animation and good creativity! I have seen this before when Funimation had on-demand of the best anime coming out and video of your favorite artist and interviews that was when it was still underground but that another story. the story is incomplete that does not mean you cant enjoy what you have here. it a true classic that non linear scope of really good. a true mystery there a love story and nice fight scenes. if there was a kick-starter to finish the series but 20 on me it a great story please support this anime classic.